Save when you buy the M5E1 (.308 platform) Enhanced Upper Receiver and Handguard Combo! 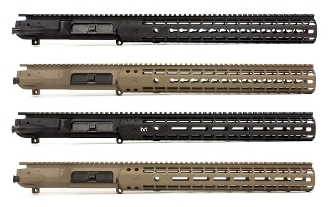 Aero Precision's new Gen 2 Enhanced Series Handguards are designed specifically to work with their Enhanced Series Upper Receiver and should be purchased as a combo. The Aero Precision state-of-the-art Enhanced Upper Receiver combines the handguard mounting platform with the upper itself, condensing the parts needed to mount a free-floated handguard to a mere 8 screws. Our Gen 2 proprietary handguards are designed specifically for our Enhanced Series Upper Receiver and are meant to be purchased together.